I recently purchased a little Elderberry bush from an on-line plant store. It was shipped to me in a small pot and is about 4 inches tall. It is listed as a York Elderberry shrub which features white blooms and in summer is to produce a bounty of soft dark purple berries that are good for cooking or making jams, syrups and wines. I replanted it in a larger pot and have it in my greenhouse at the moment. It’s just a bit too cold to plant it outside just yet. Here is a photo of the plant after 2 weeks in a bigger pot. It seems to be doing well. I’m keeping the soil moist and am following the Elderberry caring instructions found here. 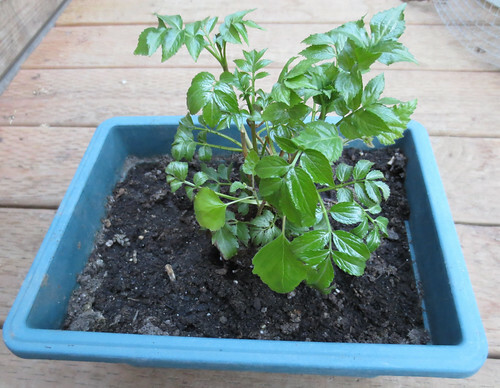 I’m looking forward to planting my shrub plant later this spring. 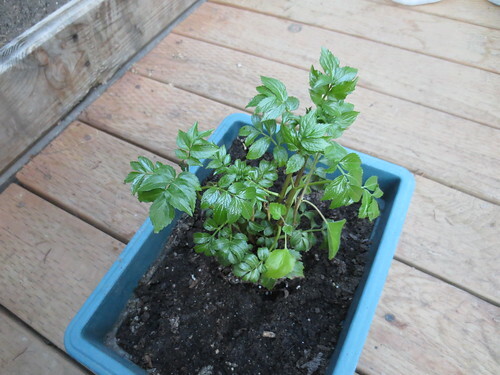 I hope in the future to propagate the plant into more starts as outlined in this Elderberry growing post. My goal is to have several bushes growing in the next few years so I can make homemade jams and syrups from the berries.